Hi! My name is Freeway. Freeway Petey “D” to be exact. I was born April 18, 2010, in Sarasota, Florida, son to TK Quick Strike and Winning Beauty, thirty-one generations of royalty greyhounds. I managed to escape my transport on Interstate I-75 early in the morning of May 9th, 2012. I was rescued from traffic thirteen hours later by a kind couple who telephoned Gold Coast Greyhound Adoption (GCGA). I was immediately taken to the University of Florida Small Animal Hospital where I was dubbed "the miracle dog" surviving the night against all odds. I had four major surgeries over the next five weeks to repair the injuries sustained to over 80% of my body. All my friends there called me "Freeway." On June 11th after five weeks in the hospital, I arrived at my foster home to Jody and Lee and their three happy greyhounds. Life was the best – lots of toys and food and midnight walks under the stars. Life was good. Then it got even better. I met my forever parents! And my forever sisters, a Golden named Maggie and a white Shepherd named Callie. And my forever home with a fenced acre to run! Life is good. Regardless of how I managed to escape my transport, I knew there was more up that road, around that curve, so I kept running. Not that I was running away from anything, but more that I was running toward something better. I told myself so many times during those thirteen hours to keep going, find my dreams and NEVER LOOK BACK. The Freeway Fund, initially established by GCGA, received donations from virtually around the world to help pay for my medical expenses. With my heart full of gratitude, I wish to continue this funding to provide the initial emergency medical attention that is needed following a serious injury to racing greyhounds while running a race. 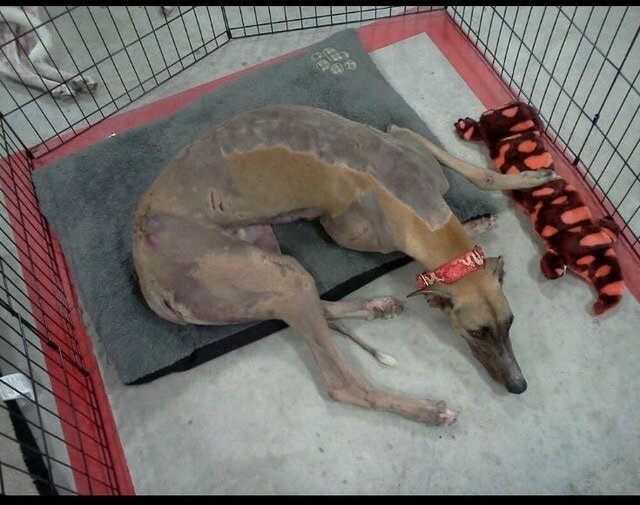 Freeway’s Greyt Escape relies solely on the generosity of individual donations, grants, bequeaths and special events for funding to provide the initial emergency medical attention to injured racing greyhounds. Please go to Freeway Fund and make a contribution to help my dreams come true by helping my brother greyhounds get the immediate medical attention they need. Freeway's Greyt Escape, Inc. works hand-in-hand with non-profit greyhound rescue and adoption organizations. 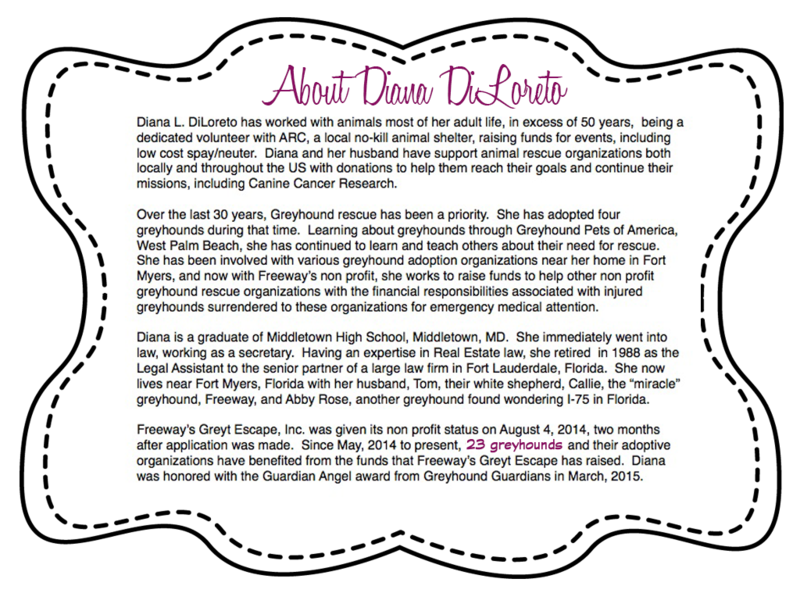 Relying on the generosity of individual donations, grants, bequeaths and special events for funding, Freeway's Greyt Escape, Inc. provides the funding for the initial emergency medical attention administered to an injured racing (surrendered) greyhound. The alliance between Freeway's Greyt escape and non-profit greyhound rescue/adoption organizations will help injured greyhounds receive immediate medical attention, surgery, therapy and ultimately, a forever home. Freeway's Greyt Escape, Inc. it's officers, directors and volunteers take a neutral position with respect to the controversy associated with greyhound racing. 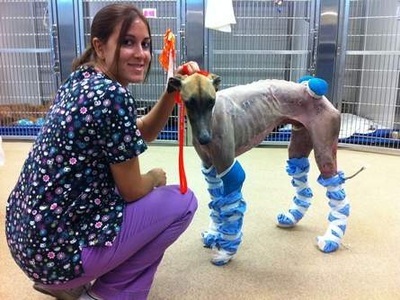 Our efforts and energy focus on the well being, medical and adoptive requirements of the greyhound itself.